2.5 lakh units of Honda Livo sold since launch. 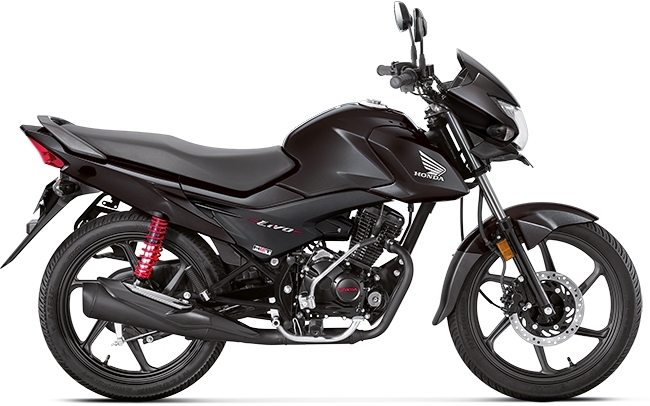 The Honda Livo was launched in India in July last year. Celebrating the motorcycle's first-anniversary, Honda Motorcycle and Scooter India has introduced two new colour choices for the Honda Livo: Imperial Red Metallic and Matte Axis Gray Metallic. The Honda Livo is available in six colours now. The Honda Livo is available in two variants - self-drum-alloy and self-disc-alloy - and in six colours now: Sunset Brown Metallic, Athletic Blue Metallic, Black, Pearl Amazing White, Imperial Red Metallic and Matte Axis Gray Metallic. The Honda Livo measures 2,020 mm in length, 746 mm in width and 1,099 mm in height, and has a wheelbase of 1,285 mm and a ground clearance of 180 mm. The entry-level commuter is built on a diamond frame and features telescopic forks at the front and spring loaded hydraulic suspension setup at the rear. The Honda Livo is powered by a 6.10 kW (8.25 bhp) 109.19 cc engine. The Honda Livo is powered by a 109.19 cc air-cooled engine that produces 6.10 kW (8.25 bhp) at 7,500 rpm and 8.63 Nm of torque at 5,500 rpm. The engine is mated to a 4-speed transmission and allows the Livo to be ridden at speeds of up to 86 km/h. Self-start system and black alloy wheels are standard. The self-drum-alloy variant has 130 mm drum brakes, while the self-disc-alloy variant has a 240 mm disc brake on the front and a 130 mm drum brake at the rear.